The tour started with a trip to the Camp Nou to watch FC Barcelona vs Malaga. The team enjoyed some culture in the city of Barcelona as they took advantage of the hop on hop off bus tour, a fantastic way to see all the famous sights of the city including the Olympic Stadium built for the 1992 Olympic games. Despite the rain, the team took a trip to the historic town of Girona. Pats first friendly ended with a marginal win by the Spanish side from Lloret de Mar but a great first showing. The team returns to the Camp Nou to see what happens behind the scenes. The team enjoyed Thanksgiving at 1700m high up in the Montserrat Mountains. The boys even learned how to cook. After winning their second game 6 - 0 Pats walked out to field in Style, with Champions league music playing in the background. The team got a special practice by some of Espanyol's coaches. Awesome facility! The Barcelona tour ended in with a fantastic day full of soccer. The first stop was the FC Barcelona Futsal game. The team was treated to a photo with the team before watching them compete in a top of the table clash. 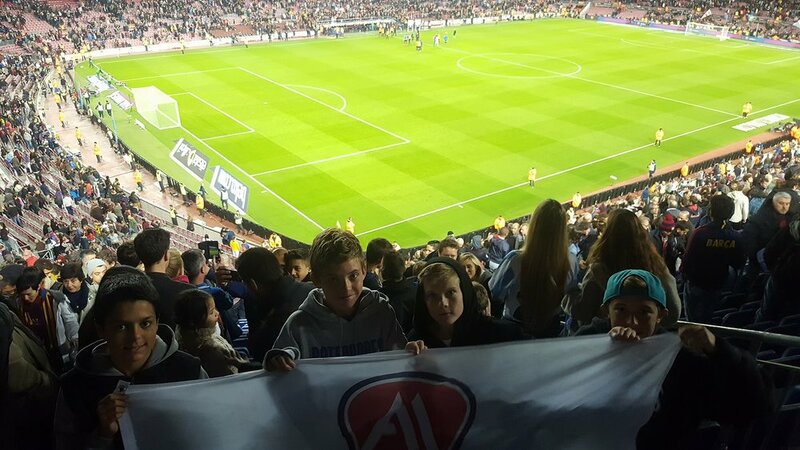 After the electric atmosphere of the Palau Blaugrana, the group moved onto Cornella to watch RCD Espanyol and were welcomed to the stadium on the big screen.